The Adventure Pals is an epic adventure platformer fuelled by imagination. Enter a gorgeous & hilarious world in a game about friendship, exploration & riding giraffes. Inspired by such titles as Adventure Time, Castle Crashers, Zelda 2 & Banjo Kazooie. The main team comprises of myself as the artist & animation and programmer Jay Armstrong, we have also outsourced some of the assets for the game. The Goal of the game was to create a game that would appeal to kids & adults. Without focusing on any one of these groups. Going for a similar target audience to TV Shows such as Adventure Time and Disney Movies. With this in mind, we had to make sure we created a game that was very intuitive that could be played by a 4-year-old or a 70-year-old. 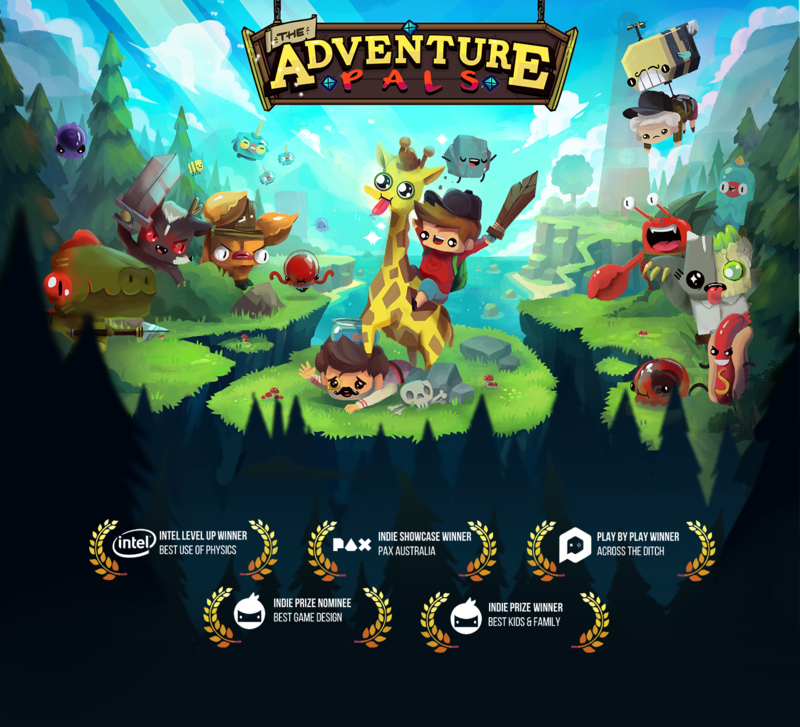 The game is based off an original Flash game called "Super Adventure Pals" then we moved to a sequel using Adobe Air project that we created for its fast prototyping capabilities. However, Since then we've moved to Unity & HAXE (OpenFL) to support Console Publishing. Judges, Please contact me for the latest unreleased version. DISCLAIMER: This demo is incomplete and does not reflect the quality of the final product. We still have lots to do in the game, so please bare in mind you may encounter some bugs and issues that will be fixed with the final release of The Adventure Pals. Here are some snippets of some of the cutscenes in the game, due to the game being unreleased I've just cropped sections from the cutscenes to avoid spoilers. Created in Adobe Animate. Firstly discussions will be had figuring out the requirements for an art piece that we need. Then I use Adobe Flash for the creation of the majority of the art, Giving the game it's cartoon/vector style look. I also use Photoshop for more of the background elements & the key art. The Design work usually will start off with drawing lots of images with a thick high contrast brush. Once the shape is defined I will go in and draw over the rough drawing. Below are some examples of this. Animation work is done in Flash for smaller items & cutscenes while character animation work is mostly done with a tool called Spine, allowing for mesh deformations in the animations.